Nailed It! Holiday! is the third season of a tongue-in-cheek baking game show streaming on Netflix. The title and premise reference the meme in which abject artistic failures attempted by amateurs are ironically celebrated. In keeping with that theme, each episode (with one exception) features three amateur bakers who compete for $10,000 cash. We watched through all seven episodes in this holiday-themed season. I know we typically break these out into episode-by-episode chunks, but the structure doesn't change from one to the next, and - aside from a few thematic shifts and guest judges - there's not a lot to discuss. With a few exceptions, everything kind of blends together. I'll get to those exceptions in a moment, but first I want to touch on the season (and presumably series, though these are the only episodes I've seen) as a whole. To its credit, it's nowhere near as negative as the premise implies. Yes, the contestants are trying (and failing) to recreate confections far beyond their skill level and allotted time, and yes, the end results are mocked. But none of the contestants we saw were under any misconception they were professional bakers. And, more importantly, there was a surprisingly positive tone permeating the show. In several cases, contestants were proud of managing to successfully bake a cake at all, and the judges sincerely seemed to celebrate and encourage their accomplishments. The two hosts are Nicole Byer and Jacques Torres. Byer is primarily there to supply comedy and energy to the show. Torres is a professional pastry chef, and he's mostly there to offer insight into what the bakers should be doing and why things go wrong. Both manage to do their jobs well without coming off as cruel (which, given the premise of the series, is pretty impressive). The one element of the show I found off-putting is the prize. Awarding the least bad baker $10,000 gives the show stakes that feel somewhat absurd. There's also a secondary prize given in the first round - usually a small kitchen appliance or set of trays worth a few hundred dollars - that seems more reasonable. Giving out $10,000 under these conditions feels somewhat arbitrary, since each of the three contestants was chosen for their lack of skill. It makes me feel for the other two contestants, who lost out on a big prize because they were matched against someone with a little more skill than them. Sometimes, it feels like you're watching a third grader beat a couple first graders in a spelling bee. But aside from that, the show's generally fun. The best of the seven episodes was easily the New Years installment, which featured Jason Mantzoukas as the guest judge. His manic, slightly unhinged comedy style was an absolutely perfect fit for the show, to the point they'd be better off making him a permanent addition. The episode also featured some great comedic moments thanks to a running gag where they'd "countdown to New Years" in a streaming show. I also enjoyed the Hanukkah-themed episode, in part because they did one and in part because of the guest judge, an elderly baker clearly having a great time. The weakest episode of the batch was the last, where they veered off in a very different direction. 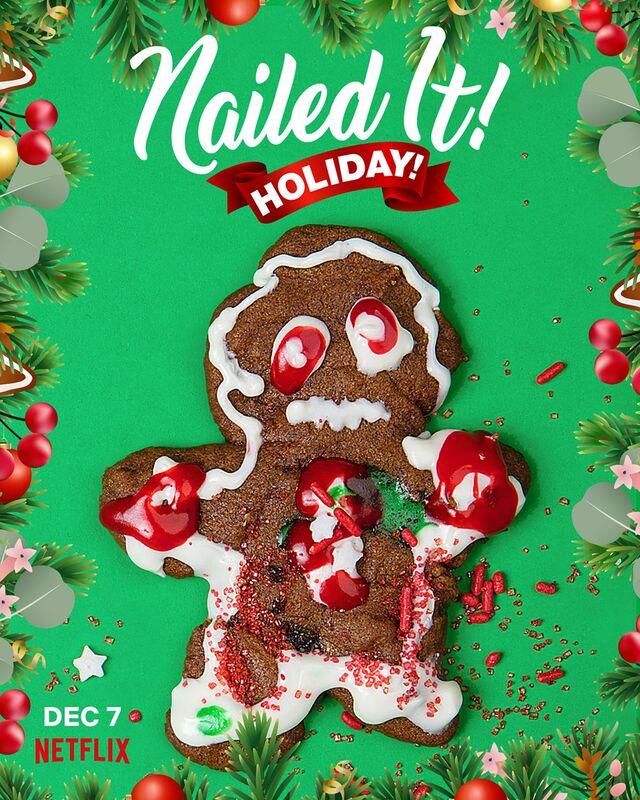 Instead of baking, this was a crafts episode, where three amateur craft enthusiasts tried to recreate a professionally done ornament and ugly holiday sweater. This was presented as something of an experiment, and my guess is they're hoping it would serve as a back-door pilot to a spin-off. The problem is there's a higher bar for amateur crafters than there is for bakers. Because of this, it became immediately apparent they were failing due to lack of time, rather than lack of skill. To a degree, this is always the case - they intentionally give their baking contestants less time than they'd need to follow the recipe and complete all the steps. But I'd believe a professional baker could have stepped in and done a decent job on at least some of the projects presented in the time given, unlike these two craft projects. As a result, it seemed like the three contestants were pretty good with crafts but were being set up for failure. Again, to a degree, that's always the case - the point of this show is that no one's going to succeed - but here it felt less fair. Doing devoting a season to the, well, season makes a lot of sense, given how many crafts and baked goods are associated with the holidays. Overall, we found this show entertaining enough - it's one of those things you can put on in the background while you're eating or cleaning. The only episode worth seeking out is the New Years, though - the rest were pretty forgettable.